MLA International Bibliography offers a detailed bibliography of journal articles, books and dissertations. Produced by the Modern Language Association, the electronic version of the bibliography dates back to the 1920's and contains over 2.3 million citations from more than 4,400 journals & series and 1,000 book publishers. The indexed materials coverage is international and includes almost 60 titles from J-STOR’s language and literature collection as well as links to full text. Project MUSE is a unique collaboration between libraries and publishers, providing 100% full-text, affordable and user-friendly online access to a comprehensive selection of prestigious humanities and social sciences journals. MUSE's online journal collections support a diverse array of research needs at academic, public, special and school libraries worldwide. Our journals are heavily indexed and peer-reviewed, with critically acclaimed articles by the most respected scholars in their fields. MUSE is also the sole source of complete, full-text versions of titles from many of the world's leading university presses and scholarly societies. Currently, MUSE provides full-text access to current content from over 400 titles representing nearly 100 not-for-profit publishers. This is a dictionary of symbols based on literature, rather than “universal” psychological archetypes or myths. It explains and illustrates the literary symbols (such as swan, rose, moon, gold), and gives hundreds of cross-references and quotations. The dictionary concentrates on English literature, but its entries range widely from the Bible and classical authors to the twentieth century, taking in American and European literature. panoramic view of world literature, including excellent coverage of Third World literature not found in other sources. Through its previous editions and supplements, it has served as a classic international reference source for several decades. Comprehensive reference: history, types, movements, prosody, and critical terminology. Articles treat their topics in sufficient depth and with enough lucidity to satisfy the scholar and the general reader alike. This site that includes biographies, sound clips, pictures, and text from American poets. Started in October 1996 in response to the developing importance of electronic media in literary research. This encyclopedia is provided online by Bartleby and can be a good starting point. It is rather dated and will not contain information about or from the 20th or 21st century. 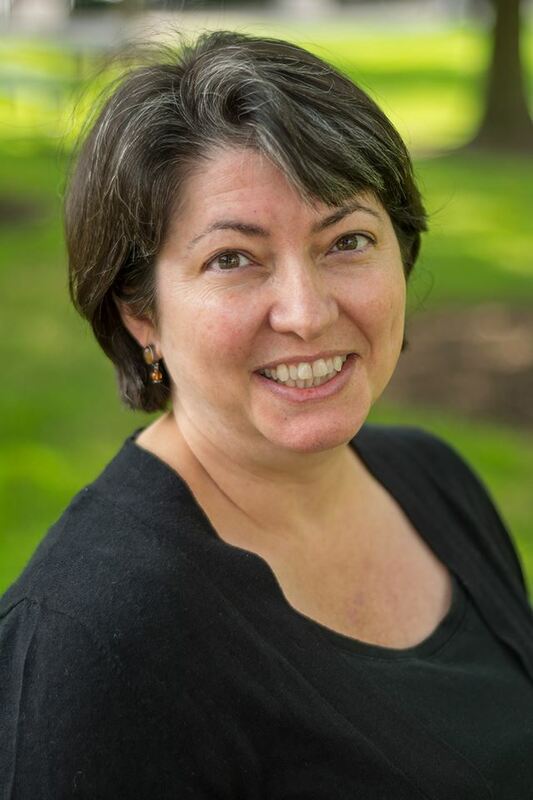 Hosted at UNC, this page provides links to reliable Chaucer and other medieval resources on the web, including Jane Zatta's Chaucer Page. Provides a web companion to the Canterbury Tales. Includes many online primary texts, critical studies, images, bibliographies, historical background information, and resources for both teachers and students. Source for cultural studies and critical theory. 18th century literary criticism resources. Collection of links useful for grad students or those thinking about Higher Ed as a career. The Electronic Beowulf is an image-based edition of Beowulf, the great Old English poem surviving in the British Library. Emily Dickinson Archive makes high-resolution images of Dickinson’s surviving manuscripts available in open access, and provides readers with a website through which they can view images of manuscripts held in multiple libraries and archives. This first phase of the EDA includes images for the corpus of poems identified in The Poems of Emily Dickinson: Variorum Edition, edited by R. W. Franklin (Cambridge: Belknap Press of the Harvard University Press, 1998). Created by Richard Hacken at Brigham Young University, this is a site of links to documents for western Europe. A journal of theory in Medieval and Renaissance Studies. This site provides listings of books and articles on literature in a variety of topics, eras and nations. A guide the Native American authors by name, title, and tribe. Includes biographical information. An online journal of rhetoric, technology and pedagogy. The Labyrinth provides free, organized access to electronic resources in medieval studies through a World Wide Web server at Georgetown University. This project not only provides an organizational structure for electronic resources in medieval studies, but also serves as a model for similar, collaborative projects in other fields of study. This well-organized signpost provides an extensive number of annotated links to academic websites related to American literature. Extensive and well-maintained list of period-specific literary resources. Major period-specific resource site which also includes links to electronic texts of many Victorian authors. Major period-specific resource site which also includes links to electronic texts of many Romantic authors. This site combines three sites created in 1996 to provide a starting point for students and enthusiasts of English Literature. Digital library of primary sources in American social history from the antebellum period through reconstruction. Digitized back issues of Harper's, Putnam, Atlantic, Scribners, Century and other 19th century magazines. Digital library of primary sources in American social history from the antebellum period through reconstruction. Includes digitized issues of 19th Century Magazines, including Southern Literary Messenger. Funded through a grant from the National Endowment for the Humanites, the Middle English Compendium has been designed to offer easy access to and interconnectivity between three major Middle English electronic resources: an electronic version of the Middle English Dictionary, a HyperBibliography of Middle English prose and verse, based on the MED bibliographies, and an associated network of electronic resources. This site supports the discussion group devoted to the life, literature and times of the poet John Milton. Full-text archive of works of American women writers in the 19th century. An on-line guide to accompany the Norton Anthology of English Literature. Excellent helpful resource for the writing process. Tons of information. The OTA "works closely with members of the Arts and Humanities academic community to collect, catalogue, and preserve high-quality electronic texts for research and teaching." A journal of literary criticism and scholarship published at Southern Illinois University. Provides access to full-text of classic and historical literature. Full-text database of thousands of books that are in the public domain. The Schomburg Center for Research in Black Culture located in Harlem, New York, is a research unit of The New York Public Library system. The Center consists of three connected buildings: The Schomburg Building, the Langston Hughes Building, and the Landmark Building. It is recognized as one of the leading institutions focusing exclusively on African-American, African Diaspora, and African experiences. Contents index for the journal Victorian Literature and Culture (NYU). E-texts of women writers of the 19th century, including extensive links to other Victorian Women Writers sites. This glossary of literary terms makes a great quick reference guide. Includes resources, some full-text, of literature arranged by era, hosted at UC Santa Barbara. Harvard University user's guide to a very useful product for organizing your research: Zotero. Your classmate's anonymous answers to the question: "What do you know about finding quality sources of information?" What is "Authority" in regards to Information Sources? University at Albany has some excellent questions to think about when evaluating the authority of information creators. A short video about our tendency to look for what we expect and disregard what doesn't fit our assumptions. "Why Facts Don't Change Our Minds"
“Consider what’s become known as “confirmation bias,” the tendency people have to embrace information that supports their beliefs and reject information that contradicts them. Of the many forms of faulty thinking that have been identified, confirmation bias is among the best catalogued; it’s the subject of entire textbooks’ worth of experiments. -“Why Facts Don’t Change Our Minds - The New Yorker 22 Feb. 2017. A short video from "How Stuff Works"
This is the work of found the author is Melissa Zimdars, assistant professor of communication at Merrimack College. While I haven’t checked each site she lists personally, I think her framework for avoiding inaccurate and misleading sources is very good. Channel 4 (from the UK) has created a useful short video about spotting fake news. Right now it's on Facebook... once they upload it to YouTube I will change the link so it directs there. 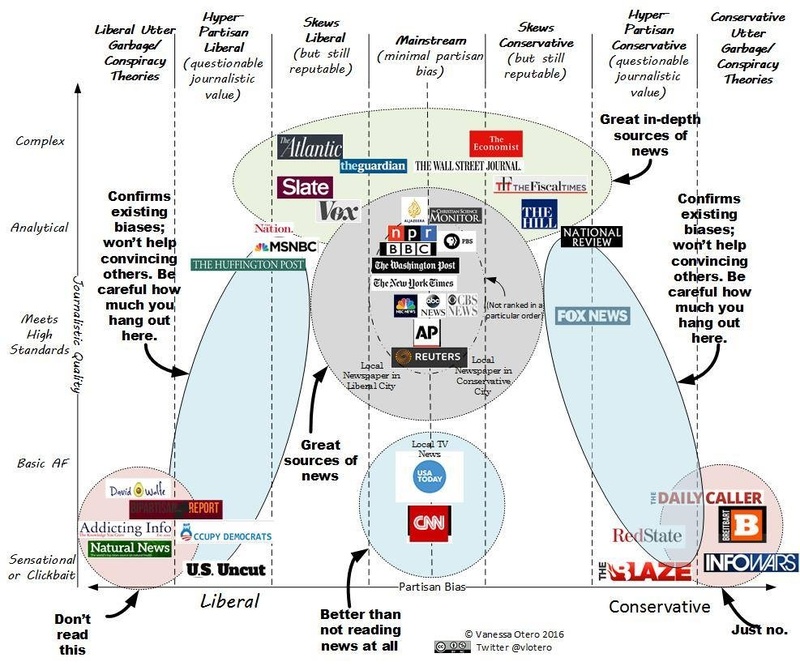 You don't have to agree with this particular news source infographic... but it's a good starting point to think about how sources might have a particular editorial slant. Seeking information from a wide range of sources is best. Should you be concerned about Dihydrogen Monoxide (DHMO)? Check out this source and see if you evaluate it using the criteria we discussed in class. Can you use Wikipedia in Academic Research? No. Wikipedia actually discourages this. However, Wikipedia can be a jumping off point, or a way to get a quick overview of a topic before more in depth research. We librarians actually use it for that purpose. Use it as a starting point only.